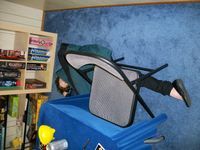 On Saturday, November 9, 2013, twenty-two gamers were sentenced to eight hours of hard labor and gaming, with only occasional junk food breaks. The inmates included Tim, New Eric, Andy, Caleb, Nyck, Alan, Cymi, Leif, Elden, Eric Classic, Tom, Tycho, Eden, Aaron, Shawn, Leif, Kory, Eryn, Gavi, Geoff, Lynette, and Ronnie. Because we have been very, very bad, we were sentenced to play yet another game of Ricochet Robots. Also, Tim is just too damn tired to think of another straggle-inner that we haven't yet broken - we can all do Krypto and SET in our sleep. New Eric found the solution to the above puzzle; Tim, Andy, Caleb, Nyck, Alan, Leif, Elden, Eric Classic, and even Cymi all found solutions to other, lesser puzzles. Zounds! 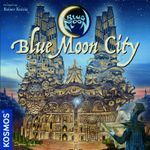 And then it was time to fire up Game Night proper - so Alan, Tom, Eden, and Tycho met at table three to do battle in the venue of Blue Moon City. It seems that either multiple games were played, or somebody went out for pizza or something, because I do not know how else you could stretch this game to two and a half hours. 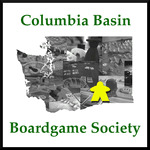 But we at the CBBS do not judge! We only have the score for one game, so the pizza theory is looking better, although it was unkind of them not to share. Anyway, Tycho eventually built 4 sections of the Obelisk for the victory; Alan and Tom were stuck on two, while Eden got just one. 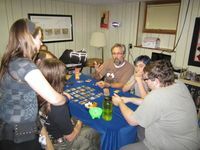 Despite the many, many gamers in attendance, the initial config consisted solely of four (or-fewer) player games. This allowed Tim to continue his campaign of getting more plays of his recent (i.e. 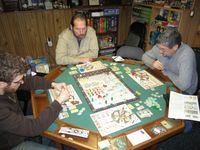 past couple years) medium-heavy Eurogame acquisitions, by forcing Nyck, Aaron, and Shawn to play Trajan on Table One. Nyck and Shawn had recently played this game, but Aaron hadn't, which gave Tim the excuse to "teach" the game and thereby re-remember the rules. Tim wanted to concentrate (at least initially) on the construction tiles, as the only Trajan tile he could score on his first turn gave two extra construction workers. Thus, it was disappointing when Shawn, who went first, immediately took the construction action and parachuted down on the exact tile Tim was eying, causing Tim to curse the vagaries of the Finger. 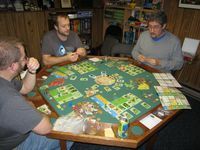 Nyck concentrated his early Trajan tiles on those big nine-pointers, while Tim eventually moved to the Provinces, Aaron did some early shipping, and Shawn continued working the Construction site. 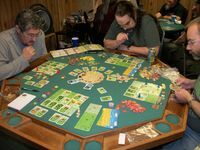 Tim also focused a lot of energy early on getting Trajan tiles, which are really important, but it was mainly just because his mancala wheel wasn't giving him the opportunities to get the Forum tiles he wanted, or make use of his extra Laborers or Legionnaires acquired via those Trajan tiles. 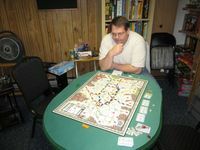 Tim was also having trouble getting the goods he needed to score his Bonus tiles, so he wasn't really shipping. 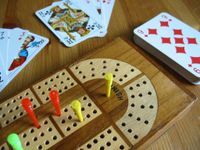 As usually happens, by the midgame everybody is forced to pivot to the other actions they haven't been doing; I don't understand all the math behind the mancala wheel, but sooner or later it seems to force you into doing those things you haven't been doing. One thing I discovered in this game is that often you want to start in a bin with lots and lots of tokens, just to seed all the other bins with a one or two and give yourself more flexibility on the next few turns. Anyway, Tim was the first to score a 10 point province, but then everybody started taking Legionnaire actions and Tim focused mainly on Rome from that point on. The Construction site was getting full, and Shawn had gotten four of a kind (using a joker) for the 20 point end game bonus, when Tim got both a Hammer (construction) extra action token and a 2x token. That let him make three moves in the Construction site, picking up his third tile of one symbol and putting him in reach of another on the next couple turns. Nobody could stop him, although Nyck was forced to grab the final Construction tile to keep Tim from getting yet another 10 points for having a fourth. 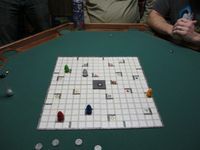 Meanwhile, Shawn was pushing to get a key bonus tile in the penultimate round, when Tim woke up with a key Senate action along with a purple Forum tile to steal first place and push Shawn to third, giving him no bonus tile at all that round. 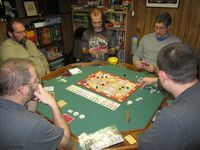 In the end, Tim's Construction actions carried the day; he and Shawn both got 20 end-game points for sets, but Tim's tiles gave him a bunch of in-game points, his Bonus tiles gave him another 18 points, he shipped a few times during the game, and scored lots of Trajan points for a total of 141. Shawn's missed bonus tile really hurt him, and he ended the game with 126 points. Nyck's 9-point Trajan strategy gave him an early lead, but those Trajan tiles do nothing to build your infrastructure (all the others feed people or give extra workers or doublers), so he couldn't maintain the momentum when they were gone and he fell to 113 points. 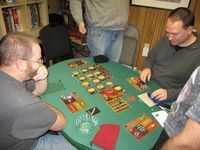 Aaron focused on goods and shipping and got to 115 points. 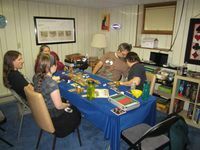 For some reason, Gavi and Cymi decided they wanted to come all the way to Tim's house to play Cribbage with each other. De gustibus. On Table Two, Andy decided to play Modern Art once again, perhaps in the vain hope that if he plays it enough he might get good at it. He was joined by Elden, Caleb, and Leif. Modern Art is an auction game, and thus is very susceptible to group-think. Its hard to argue, in isolation, that somebody is playing "wrong", because how you play should be based on how everybody else is playing, and will affect how they play in turn. In this game, it seems that not buying lots of paintings was the way to go; Leif made Elden overpay on Karl Gitters, and Andy ended up buying one of his paintings in a sealed auction, which suggests that there was some general disagreement on what the value would be. Anyway, Caleb claims he didn't buy many paintings this time, but still ended up with the winning total of $486,000 - perhaps everybody else was overpaying? Elden, despite his Gitter-induced haze, finished with $417K, while Leif scored $406K. Andy rounded out the group with $337K. 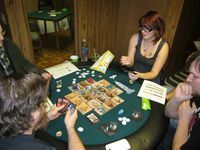 Back in the Lounge, Eric Classic, New Eric, and Honorary Eric Kory played something called Pandemic: In the Cab. Sounds like my last ride home from the airport. Ah - In the Lab. I guess that makes more sense. Anyway, this expansion appears to give a whole nuther board on which to put stuff. Hooray! But, despite all this Laboratory goodness, the world was once again killed by the Black Death. The hapless Scientists claim they were one turn away from winning, but ran out of cards in the player draw deck. I'm sure that will earn the heartfelt sympathy of the aliens who discover the ruins of humanity. 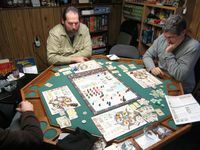 At this point, Tim and Andy came to blows when the latter wanted to play Ora et Labora and the former forbade it, on account of the fact that Tim wanted to play but was still in the midst of Trajan. Fortunately, cooler heads prevailed and only some innocent bystanders were killed. 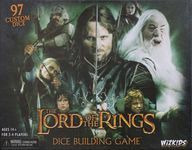 So, Caleb, Elden, Andy, and Leif decided to play The Lord of the Rings Dice Building Game instead, in spite of its horrendous name. Unfortunately, Andy forgot a key rule - Sauron gets dice whenever you buy some, without which the game becomes really easy. Andy's score of 15 is circled, so perhaps this is one of those games where the lowest score wins. If so, then Andy won; if not, then Caleb and Elden (who liked recruiting Ents) won with 20. In neither scenario did Leif's 18 point score prevail. The real (Classic and New) and virtual (Kory) Erics were joined by two more pseudo-Erics, Gavi and Geoff, in order to take on Forbidden Desert. Sadly, the adventurers only found two out of the four missing airship parts before they were overrun with sand and scoured from human memory. Too bad! Andy and New Eric then played a seven second series of the strategic tour de force, Rock Paper Scissors. 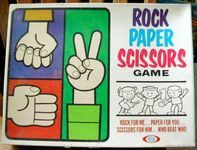 Or maybe Rock, Scissors, Paper. Or possibly Rock - Paper - Scissors. 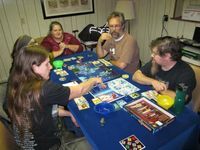 Eric Classic, Kory, Eryn, Lynette, and Alan hadn't had enough of trying to destroy the world, so they played Pandemic again. But this crew was determined not to lead the human race to extinction, so Eric cherry-picked the roles to increase their chances of success. Eric was the Pilot, Kory was the Medic, Eryn was the Generalist, Lynette was the Operations Expert, and Alan was the Quarantine Specialist. This shady bit of shenaniganery paid off, as, for once, humanity was saved. Yay. For the reconfig, Tim, Elden, New Eric, and Aaron decided to play On the Underground, because both London and trains are cool. This game will often evolve in one of two ways. If everybody is playing defensively, they will prevent anybody from forming a central loop and scoring the contained stations; but if everybody is playing offensively, then you can get a couple different players scoring a loop, and that will often be the margin of victory. In this game Tim scored a smaller 4-point loop early on, but New Eric and Elden came back to score major eight-point loops of their own. In the end the game was very close, with Elden eeking out the win, 46 to 45 (Tim) to 44 (New Eric) to 41 (Aaron). If only New Eric hadn't managed to block (possibly inadvertently) Tim from scoring another Tourist connection, he could have been a contender. Instead of a bum, which is what he is. Meanwhile, Andy was granted Table One just so that we could get his game of Taj Mahal on video, for no reason. Shawn, Caleb, Leif, and Nyck were the other Indian Princes. Shawn scored 42 poitns. Andy scored 39 points. Caleb scored 36 points. Nyck scored 36 points. Leif scored 32 points. Table Three then managed to play a very long game of Pirate's Cove. 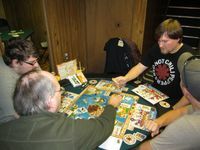 The languid pirates included Tom, Geoff, Eden, Tycho, and Ronnie. Tom scored 36 points and earned a star next to his name, so let's call him the winner. Ronnie finished with 32, Tycho scored 28, Eden accrued 27, and Geoff scrounged up 20 points. 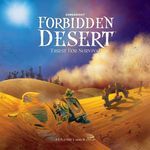 Table Two finished mid-config, so Elden, Tim, and New Eric decided to wander in the Forbidden Desert for a while. After correctly deducing where the water was and with clever use of tunnels and special powers, the team rather easily found all four missing parts and reconstructed their ridiculous flying machine to escape for the victory. Hooray! 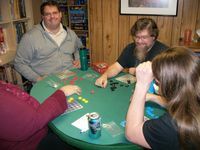 Because some people never ever leave the Lounge, Eric Classic, Alan, Lynette, Eryn, and Kory played Dice Town back there. Boo! The extremely bitter scoresheet claims that Eryn showed "favoritism" to Kory ("maybe a little bit too much"), which may explain why he was able to prevail with 50 points. Eryn scored 48 for second place, while Eric Classic finished with 35, Alan earned 32, and Lynette gained 22. Despite the "late" hour (c'mon, it wasn't even midnight! 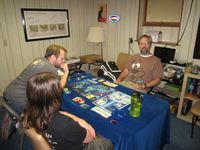 ), Andy finally forced Tim, Shawn, and New Eric to play his newly acquired (for some kind of "birthday") game of Ora et Labora. Hooray! No matter what hour you start this game at, you still have to account for the fact that there are zillions of tiny little cards with scads of tiny little text on them. There probably isn't any way around that in a game like this, where each card represents a unique building with unique powers and abilities. But it did force Tim to focus on the things he could see from across the table: the background color of the initial buildings. In particular, the Fishing Village was the only beach card, and Houseboat was the only water card. 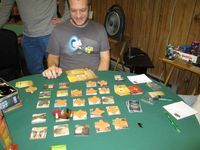 Thus, a strategy formulated in Tim's mind - be the first one to expand to the beach, and get those cards. Hooray! That gave him a framework for the first few turns, after which he realized the importance of stringing your Settlements together. He spent most of the game building up and down the beach (waterfront also gives connecting points to settlements), using his Priory to sneak extra uses on buildings the other players have just built (and therefore put their Priors on), and saving his pennies to build the Grand Manor - which cost 20 coins but gave 18 victory points in itself and a ton of connection points. One of the bad things about a game like this is that you really have no idea what the other people are doing. It takes up all your energy to just figure out what you are doing. Shawn managed to get a lot of settlement connection points and seemed to have a pretty good engine of some sort - but in the final, extra turn he couldn't find a way to get more than four points for a random luxury good tile, while Tim used one of New Eric's buildings (the Cloister Workshop) to get 13 points in luxury goods, cashing in all those bricks and stone he'd been hording. That was the difference, as Tim won, 161 to 152. Andy couldn't get his settlements to synergize and New Eric only built three of his; they finished with 138 and 123, respectively. 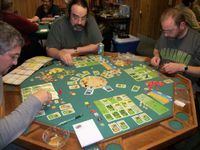 The breakdown of the final scores are interesting; it is clear that scoring big on your settlements is one of the keys to winning, as Tim and Shawn both did well (89 to 81), while Andy scored 73 and New Eric 38. New Eric made up some ground by scoring lots and lots of goods; he was the only one to get one of those big 30 point Wonders, giving him 42 points in goods, while Tim, Shawn, and Andy scored 24, 19, and 15, respectively. The points for buildings was basically a tie, with everybody in the mid-forties to low-fifties. The first time you play a game like this, even if you understand the mechanics, its hard to figure out what you should actually do. So, for those of you looking to try this - settlements are important. In the early game you have to find the resources so you can build them on the next building turn, and you need to always keep in mind how you can maximize your placement. Ideally, some kind of checkerboard pattern, with room to plop down really valuable later buildings to be scored multiple times, is probably most efficient - but, of course, that takes a lot of planning and knowledge of what buildings are going to be available. The non-Table-Oners had a couple hours to slay, so they started with a few rounds of Finito!. Initially, it was Leif, Nyck, and Elden. Leif won five games (two of them jointly), while Nyck and Elden earned one joint win with Leif apiece. 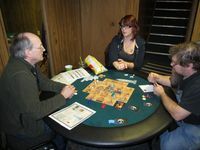 Then, after a mysterious forty minute gap, Alan, Kory, Lynette, and Elden played three games, with Lynette winning two and Alan one. 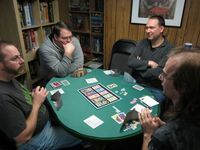 Then, over on Table Three, Nyck, Tycho, Eden, Geoff, Ronnie, and Elden played a quick, murderous game of Shadow Hunters. We have no indication of what team anybody was on, but five of the six players ended up dead, so apparently bullets and rusty butcher knives were flying furiously. Elden died first, followed by Ronnie and Nyck, with Geoff and Eden dying at the same time. That left Tycho, whoever he was, the winner. 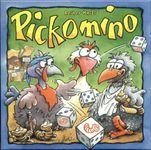 Next up for Table Three was a chunky and draconian game of Pickomino. Tycho ate six worms for the victory! Kory ate four worms. Ronnie and Nyck ate two worms. Eden ate but a single worm. Geoff ate no worms at all. Finally, Table Three played a glib and probable game of Toc Toc Woodman. On the scoresheet, Tycho, Ronnie, and Nyck are all given one point and credit for a joint victory. Eden, Kory, and Geoff scored nothing. This probably means three rounds were played in all. Or maybe it means they were using some alternative scoring mechanism, where the sum of everybody's score totaled exactly three. That might actually be possible if enough cores are left after all the bark is taken off, but it would take a scientist to do the calculations. 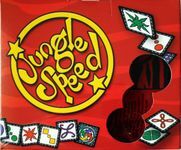 The final game of the evening, to the dismay of many, was a boisterous and wicked game of Jungle Speed. Amongst the Speeders were Elden, New Eric, Kory, Tycho, Andy, Tim, Eden, Ronnie, Geoff, and Nyck - although all of them did not make it to the end. On the very first round, a new thing that had never happened before in the history of the universe or beyond actually happened - Elden turned up a Color Match for his final card. 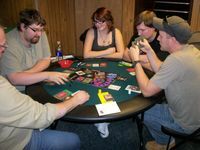 Our house rule is that the guy who turns up a Color Match plays over it (otherwise the action stays on the first three or four players to his left until an All Grab or mis-grab occurs), which obviously we couldn't do here. So Tim ruled that, even though you could see Elden's Color Match card right there, it was null and void, and the regular matching rules would be in effect. However, it did mean that it would be very difficult for Elden to actually win the round, since he would never match anybody else. But instead of waiting for an All Grab or a misgrab, Elden misgrabbed himself when New Eric and Kory were out of cards, to give them a joint victory and end Elden's suffering. The other rounds were less eventful; Tycho won round 2 when Geoff knocked over the token, and Andy won round 3 when Elden misgrabbed again. Andy won again in round 4 when New Eric couldn't find the handle on the token. And, to close out Game Night, Tim won round 5 due to superior strategery and skillful play. 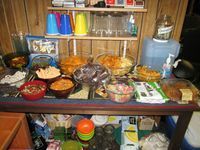 The Game Night attendees had a healthy appetite this time around, as only a few Spicy Sweet Chili Doritos, Buffalo Bleu Krinkle Cut Kettle Chips, and (of course) the digestive health mix made it through the night. The new item on this table were the Sweet Potato Chips, which were more starchy than sweet and thus provided an interesting sensation for the sophisticated palettes for which the CBBS is justly known. This was also the evening for very spicy snacks; in addition to the aforementioned Doritos and Kettle Chips, we had the Sante Fe Snack Mix, and someone brought some outrageous Habañero-flavored chips, which were hot enough to bring a grown man to his knees. Elden also brought some of his Killian Korn Confections, and several other snacks were similarly provided by other guests. 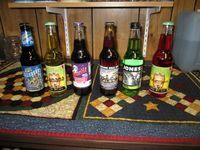 To celebrate the harvest season, our specialty soders were all fruit flavored. Hooray!